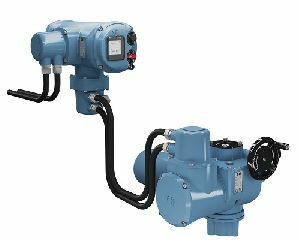 The innovative Rotork CK range of modular electric valve actuators is designed to meet diverse actuation applications in the power and water industry. Built on the cornerstones of reliability and safety inherent in all Rotork products, the CK enhances the scope of Rotork flow control technology. The modular CK design provides flexibility and configurability, enabling quick selection from stock to meet customer specification with short lead times. The torque range facilitates reliable operation of valve types and sizes typically found in industries such as power generation and water treatment. In combination with secondary gearboxes, the CK range maximum multi-turn output torque is 10,800 Nm (8,000 lbf.ft) and part-turn torque is 205,600 Nm (151,600 lbf.ft). A direct-drive part-turn CK range is also available. The modular construction presents a wide range of options and features. These range from a standard CK actuator, requiring separate motor controls, to sophisticated Centronik versions equipped with an integral state-of-the-art intelligent digital control unit. The Centronik module can be mounted up to 100 metres from the actuator to provide local operation, configuration and commissioning for valves in inaccessible locations. All CK versions can provide mechanical valve position indication. Standard features also include oil bath lubrication for extended life, mounting in any orientation, a safe motor-independent handwheel operation available at all times, and IP68 environmental double-sealing. Increased valve protection is provided by independent torque and position sensing. Plug-and-socket connections facilitate fast and efficient commissioning and maintenance. All actuator sizes can utilise separable thrust or non-thrust bases, enabling actuators to be removed from the valve without affecting valve position. The Centronik digital control unit provides intelligent control with datalogging for diagnostics and asset management, offering cost-effective integration with centralised and distributed control systems. Compatibility with hardwired, analogue or digital control protocols includes Rotork Pakscan, Profibus, Modbus, DeviceNet and HART. Rapid and secure commissioning and configuration is performed using the actuator selector switches. A handheld Rotork Setting Tool, using infrared or Bluetooth® interfaces, is optionally available for these functions. The actuator display window provides position indication, status and alarms plus user-friendly menu-driven configuration screens. The Rotork worldwide network of offices and representatives provides a local source for sales, service and support for the CK range of actuators. Find out more about the CK range.